Hey guys and gals! Welcome to the annual annaish survey and q+a. It's the day where I ask you to do two things. 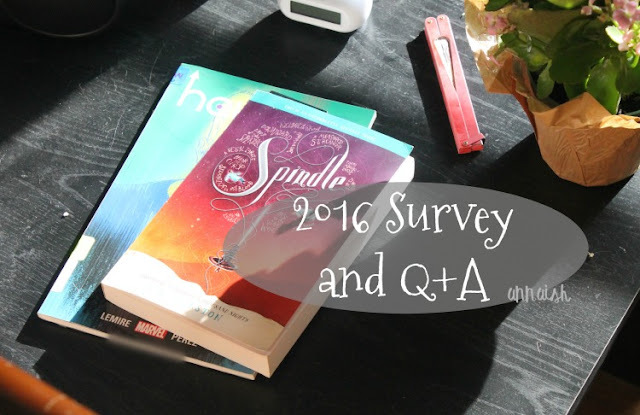 One: I ask you to take the official annaish survey (2016 issue). It's super easy and there's only 12 questions. Super peasy and will be much appreciated! And the second thing: I invite you to ask me questions. You can me ask my current fav song to my worst fear. It's super fun, for you and me! Are you ready, bookworm? Happy Wednesday bookworm. Thank you so much for supporting annaish! <3 Have a great day. - What ship makes you go "ASDFGHJKL YAS!!!"? - Book that made you cry? - Book that made you happy? - Do you like pizza? - Would you say you enjoy pizza whilst reading a good book? - Can you tell that I am making these up as I go? - Do you have any tips on mastering book-ish themed photos? Because your bookstagram is stunning. Just sayin'. Aww thank you so much! Should I shoot you an email or DM with some tips? This is the first time I"m commenting on your blog *waves* can I just say that I LOVE your instagram. Thanks for being awesome! Hi Shanti! Welcome to annaish. Awww thank you so much!! Thank YOU for being so kind!